Asus had a surprise for everyone during its ZenFone 2 event today in Taiwan. In addition to unveiling the Asus ZenFone 2, the manufacturer introduced the ZenFlash. This is a dongle that comes with a Xenon flash that connects to your Asus phone using a USB OTG connection. The resulting flash is said to be as much as 400 times as bright as your typical LED flash. All of the important stuff like pricing and availability is being saved for another day. Wait. There's more. 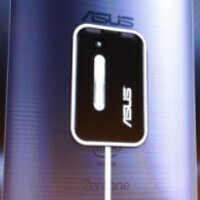 Before sending everyone home, Asus also introduced the LolliFlash. This is your run-of-the-mill two-tone LED flash in a circular lollipop looking package. Available for any phone with a handset, the battery operated product is a torch as opposed to a flash. That means when it is turned on, it stays on. The idea is that you turn it on just before taking a photograph or a selfie to take advantage of the additional light that the product generates. And LolliFlash comes with three protective covers in red, yellow and blue, that double as a filter. Still no pricing or availability here either. You can check out some pictures showing off the two lighting accessories by clicking on the slideshow below. Well this can be useful... But it's a tad too thick. A xenon flash beats any LED flash many times over. Dual capacitor Xenon on the 808 PureView for the win! Even the newer 1020 can only bring a subjective "tie" against the 808. As a camera phone, it still is KING. Only for Asus phones? The ZenFlash, namely. Let me get one of them Lolliflashes.lol It sounds weird saying it out loud. They may want to rethink the name? Utterly clunky! Why not just equip the phone with a xenon from the start...? This will be nice as an Ara module. If BOUNCE flash is possible then this is better than any phone with Xenon flash already included.